Not even online services are immune from the atmosphere of corporate takeovers, acquisitions, and mergers, as CompuServe's buyout of The Source illustrates. The two information services share many of the same features, but each has unique offerings. The combination of the two could result in an even better resource for subscribers. CompuServe subscribers won't be affected, but Source subscribers will be converted to a CompuServe membership. CompuServe will send an ID number and a password to former Source subscribers and include an added bonus of $20 worth of free time. The online cost will remain the same ($6.00/hour at 300 baud, S12.50/hour at 1200–2400 baud). 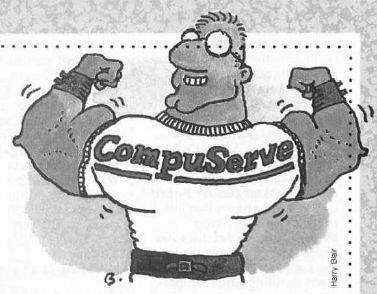 CompuServe expected to increase its subscription numbers significantly with the buyout. Source representatives estimated a 25-percent overlap between users of the two services, which would translate into an additional 39,750 clients for CompuServe. One of CompuServe's transitional tasks is to evaluate and consolidate its offerings. Overlapping services will be eliminated, and features previously unavailable on CompuServe (but sold on The Source) will be incorporated into the new service wherever possible. A new library of files for downloading is being created by merging the thousands of existing files from both databases.